In the old days, the conventional wisdom on Wall St. was that mergers were exciting, they created value, they just were good. And the bigger the merger, the better. In recent years, however, mergers, particularly among large-cap companies, have not been looked upon so favorably. And the results mostly bear out this skepticism. Consider the merger of Citibank with Travelers. The price of a Citi share at the time of the October 1998 merger was $32.50; today the stock sells below $25. Ten years later, a 25% lower shareholder value. Not a pretty sight. Or what about the infamous merger of Time Warner with AOL? On January 10, 2000, when the merger became effective, Time Warner stock sold for $71.88. Today you can buy a share of Time Warner for under $15. One of the great evaporations of shareholder value in financial history. And then there's Vivendi-Seagram. And then there's... well, you get the picture. Bigger is not necessarily more beautiful. Most of these ill-fated mergers were the results of misguided intentions. Often, it was the aggrandizing drive that so many managements harbor. Or the competitive "mine is bigger than yours" syndrome. At other times it was a desire for diversification. And, egged on by aggressive investment bankers and a receptive stock market, the deals got done. But of all the megadeals in the last 10 years that have engendered opprobrium, few have rivaled in negative views the combination of Hewlett-Packard and Compaq Computer. Announced the week before 9/11, the HP-Compaq merger was met with almost universal skepticism and cynicism. And well after the merger was consummated in mid-2002, the doubts continued. Today, the merger is nearly six years old. And, surprise, surprise -- it's turned out to be a sensational combination, whether measured by market share, market leadership or increased shareholder value. Before going further, I should disclose that from shortly after its founding in 1982 until the year 2000, I was non-executive chairman of Compaq Computer. Retiring a year before the HP merger was announced and two years before it became effective, I had neither knowledge of nor participation in the deal. Another disclosure -- I currently own no stock in Hewlett-Packard. I'm simply an interested (analytically, not financially) observer. When I heard about the merger upon its public announcement, I thought to myself, this sounds like a terrific deal. I knew a lot about Hewlett-Packard, and obviously, a lot about Compaq Computer. And what I knew was this: most of Hewlett-Packard's weaknesses were complemented by Compaq's strengths, and, the converse. In other words, the two should fit together tongue in groove. This was a merger of two big companies that ought to work. But, somehow, this view of was not widely shared. Leading the fight against the merger was a son of HP co-founder Bill Hewlett. This sometime cellist, Walter Hewlett, sat on the Hewlett-Packard board and also on the Hewlett-Packard Foundation board. He controlled a lot of stock. And he became the leader of the opposition to the merger. Quoted in the New York Times of February 1, 2002, Walter Hewlett said, "The Compaq merger is a dangerously risky, a very costly, step... The risk is great that trying to meld two disparate companies and cultures together in the computer business will come to grief." Other observers were equally caustic. Quoted in Time magazine shortly after the merger announcement, Todd Kort, principal analyst for Gartner Research, said, "This is not a case of 1+1 = 2. It's more like 1+1 = 1.5." IDC analyst Roger Kay said, "Dell must be totally gleeful, because these guys are going to spend all their time untangling themselves." The competition, of course, was quick to chime in. In the New York Times, unnamed Dell Computer executives were quoted as saying, "There is a significant opportunity for us..."
Finally, my favorite comment came from Michael Dell, CEO of Dell Computer, who called it "the dumbest deal of the decade." Did Hewlett-Packard and Compaq make a colossal mistake? Was this a dumb deal? Or are all these commentators be wrong? Well, for a while, these Cassandras looked pretty good. After the companies merged, the integration and execution went poorly. Many of the best and brightest from Compaq left, some voluntarily, some not. CEO Carly Fiorina was the architect of the merger and its champion. She made it happen despite fierce opposition from the Hewlett and Packard family members, their foundations, and from other large shareholders. But while she did the deal, she simply did not have the skills to manage one of the world's largest technology companies. For almost three years, the company failed to realize the potential of the combined companies. In early 2005, criticism of the company and the merger reached shrill proportions. And then her coup de grace: "This merger has been a lemon...Stand up, Walter Hewlett, and take a bow." Six weeks after publication of this article that pilloried Hewlett-Packard, the board hired Mark Hurd to replace Fiorina. Only then did the company acquire the management skills needed to take the raw material that was there and transform it into a world leader in technology. In the three years since Hurd became CEO, the results have been truly remarkable. He took the pieces assembled by Fiorina, applied his management skills to them, and created a growing, profitable and increasingly valuable company. Nothing illustrates the success of the merger better than the chart below. 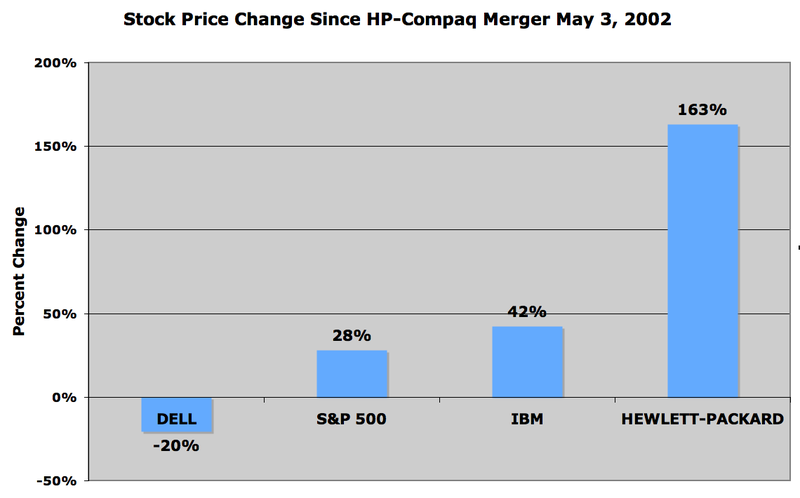 It shows the stock price changes of Dell, IBM and Hewlett since the May 3, 2002, HP-Compaq merger. 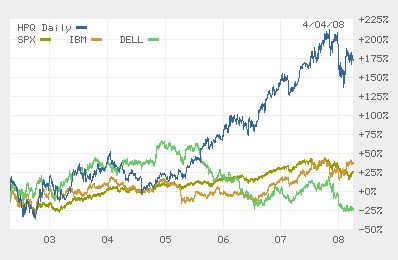 Dell Computer, once the darling of the business press and industry analysts, has seen its stock price drop 20%. The S&P 500 has risen 28% and IBM 42%. Meanwhile, the once-maligned Hewlett-Packard has seen its stock price soar 163%! So much for a lousy merger. Where did the pundits go wrong? Well, first of all, they're pundits. "Those who can, do; those who can't, opine." Second, they typically apply conventional wisdom (e.g., all big mergers are bad) rather than analytically looking at whether there is a real fit between the two merging companies. And finally, for the initial three years that the merged company was managed by Fiorina and was struggling, the criticism focused on the "folly" of the merger. It's now clear to all, even to pundits, that the merger wasn't the problem; it was the management. All Hewlett-Packard needed was strong management in order to realize the latent potential of the merged company. What are the lessons of this story? Well, we might start with this: Generalizations (and conventional wisdom) are not always true (generally speaking). And then this: Technology pundits are about as prescient as political pundits (and we know how good they are). Another lesson: Dell Computer at the time was lauded by analysts and the business press as having the best computer industry model, the model for all time. Now, in hindsight, it seems that the Dell model was the model for a time, not all time -- and that time has long passed. By the way, we haven't heard much from Walter Hewlett recently. On the day of the 2001 Hewlett-Packard board meeting that discussed the HP-Compaq merger, Walter was AWOL. Where was he? He was at some musical event playing his cello. My guess is that he is still playing his cello. You might say, then, that "Walter fiddles while HP earns."